In a city already lacking local media, failing to represent Brampton’s diverse population could lead to lost opportunities for residents, said participants at a recent town hall on media diversity in Brampton. 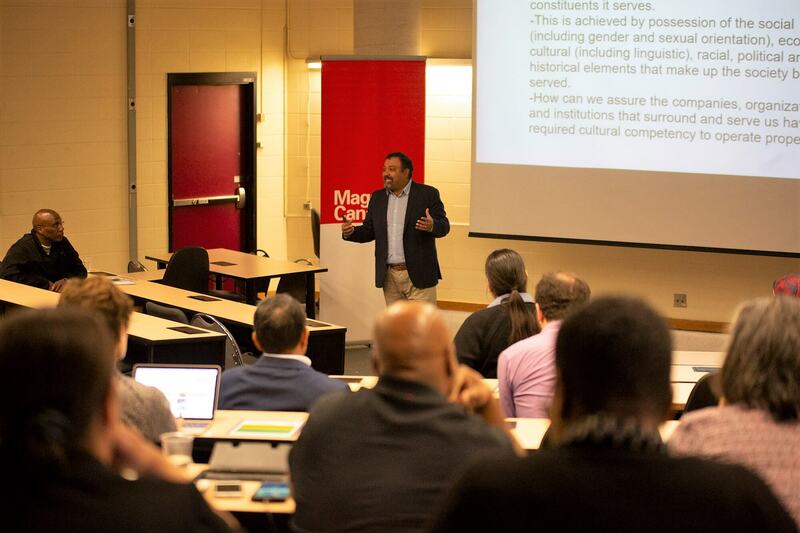 New Canadian Media (NCM) and Magazines Canada hosted the event titled “What’s the cost to Bramptonians when the media doesn’t represent them?” at Sheridan College’s Davis Campus last Saturday. About 35 participants attended, including members of the media, non-profit groups, and residents of the GTA. The event followed a research survey commissioned by the two organizations, and found that despite Brampton’s population being 73 per cent visible minorities, the staff of Brampton’s media outlets are mainly white. Among the concerns raised at the town hall was that Brampton has very little media to begin with. Currently, Metroland’s Brampton Guardian is the main print newspaper in the city, and while it’s free, the publication went from twice-weekly to once-weekly in 2017. Other local outlets include Bramptonist, Brampton Focus, and The Pointer, which are all digital. The existing outlets didn’t always tell cover the stories the community wants to read, participants said. Part of the reason there’s insufficient local media coverage in Brampton is due to industry-wide cuts, according to Roger Belgrave, the new managing editor of Brampton Guardian. According to Belgrave, the Guardian’s staff has shrunk over drastically over the years “We simply can’t get out to all the events that people want us to get to,” he explained. One of the consequences of not having representative local media discussed at the event was the loss of opportunities to address issues facing the community. “Brampton only gets into the [mainstream media] when there’s a crime,” said San Grewal, founder of The Pointer, and moderator of the event. “But when there’s pressure on why the new provincial government won’t help fund things like fighting crime, why will they only focus on Toronto?” said Grewal, pointing to how the Ford government announced it would provide $25 million in funding to address gang and gun violence in Toronto. “What matters is covering the community in a way that isn’t saying ‘We have to do this because it’s diverse,’” said April Lindgren, a professor at the Ryerson School of Journalism. Lindgren leads the Local News Research Project at Ryerson. “When you’ve got 73 per cent of the population that is a visible minority, by definition, you should have mostly visible minority people reflected in your pages,” she added. “If you’re heavily emphasizing city hall coverage, which until recently wasn’t very diverse, […] you’re not going to ignore the news and the politicians involved, but you do have to make sure that you’re hearing from the 73 per cent in terms of reacting to that news,” Lindgren added. Some participants questioned whether the presence of journalists of colour make a difference if they don’t have the power to decide which stories are told. “My experience with the media has always been that the people that select the stories that are going to be covered aren’t necessarily people that look like us,” said Ranjit Khatkur, founder of the Peel Coalition Against Racialized Discrimination. The Brampton Guardian told NCM that their minority staff included one manager and two full-time reporters. At The Pointer, Grewal, the founder, and Tanweer, a full-time reporter, are visible minorities. The Bramptonist has a meanwhile has two visible minorities on staff, a freelance reporter and a volunteer contributor. Shinda Singh, who writes opinion pieces for the Bramptonist, told NCM that being a member of a visible minority at a media organization helped him exercise more influence than approaching media from the outside. “You already have a seat at the table,” he said. Singh provides members of the Bramptonist‘s editorial board with context on issues affecting the city’s Sikh community. However, he added that journalists of colour are not always given the power to influence decision-making in newsrooms. When journalists don’t prioritize diversity in their reporting, it can affect how people perceive their own ability to make a difference in the community, says Lindgren. “We also hear a lot of discussion about the need for role models. So, if people don’t have any role models at the political level, they don’t think of it as being possible to be part of the power structure of a community,” she added. Do you think it is important that media organizations reflect the demographics of their audience?